Disney has Mickey. Pillsbury has the Doughboy. For British heavy metal band Iron Maiden, it’s Eddie. Also known as Edward T. Head or Eddie The Head, Eddie – a macabre, skinless, zombie-esque figure – has been the band’s merchandising icon for more than three decades. In that time, Eddie has become synonymous with the band, the main image of their album covers and t-shirts. He even appears onstage with the band during concerts. His gruesome visage has made it’s way onto such unlikely merchandise as mugs, bottle openers, hats, scarves, Christmas wrapping paper and even a “Giant Eddie Candle”. Many artists have provided artwork featuring Eddie for the band over the years, but the creator and man responsible for Eddie is Derek Riggs. Riggs, a 55-year-old English artist who now resides in California, was the band’s main artist in the 1980s, creating the artwork for every Iron Maiden album released in that decade. Riggs’ fantastical, comic-inspired artwork excited the imagination, loyalty, and pocketbooks of Maiden fans globally. I recently had the opportunity to interview Riggs, one of my childhood idols. As a teenager in the 1980s, Riggs’ posters were pinned to all four of my bedroom walls (and if I didn’t have acoustic ceilings, they’d have been pinned there too). Now I was talking to this man on the phone, finding out everything I ever wanted to know about an artist who was simply a name to most fans; a by-line on Iron Maiden’s album liner notes: “Illustration by Derek Riggs”. In the world of album cover artists, however, Riggs is a rock star. Akin to other successful cover artists such as Storm Thorgerson (Pink Floyd), Roger Dean (Yes) or Peter Saville (New Order, Joy Division and Peter Gabriel). 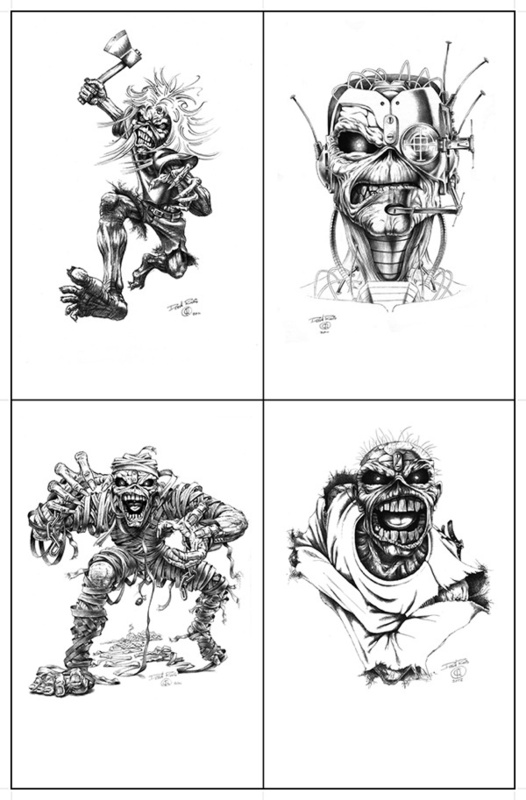 Riggs’ artwork helped spur on Iron Maiden’s success, providing the marketing basis for Iron Maiden’s commercial success and “cool factor” with kids. Riggs said his first inspiration as an artist came from comic books. Jack Kirby illustration of “The Silver Surfer“. 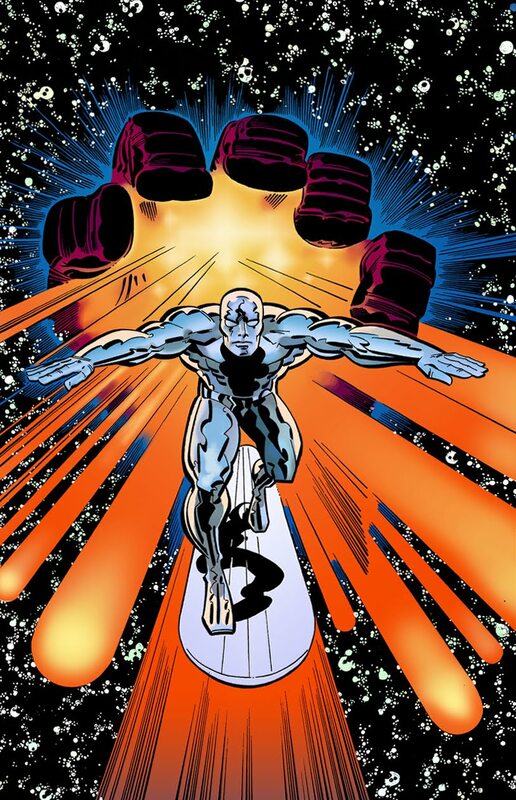 Kirby was influential to Riggs’ style. Riggs said he gleaned inspiration from more traditional artists early in his artistic career. But he soon began to focus entirely on his own vision. I asked if his parents were supportive of his early artistic ambition. Electric Matthew Says Hello was the genesis of the first Iron Maiden album cover. Immediately, the band knew they had a good thing on their hands with Riggs. They signed him to an exclusivity contract that barred him from doing art for any other musical acts. 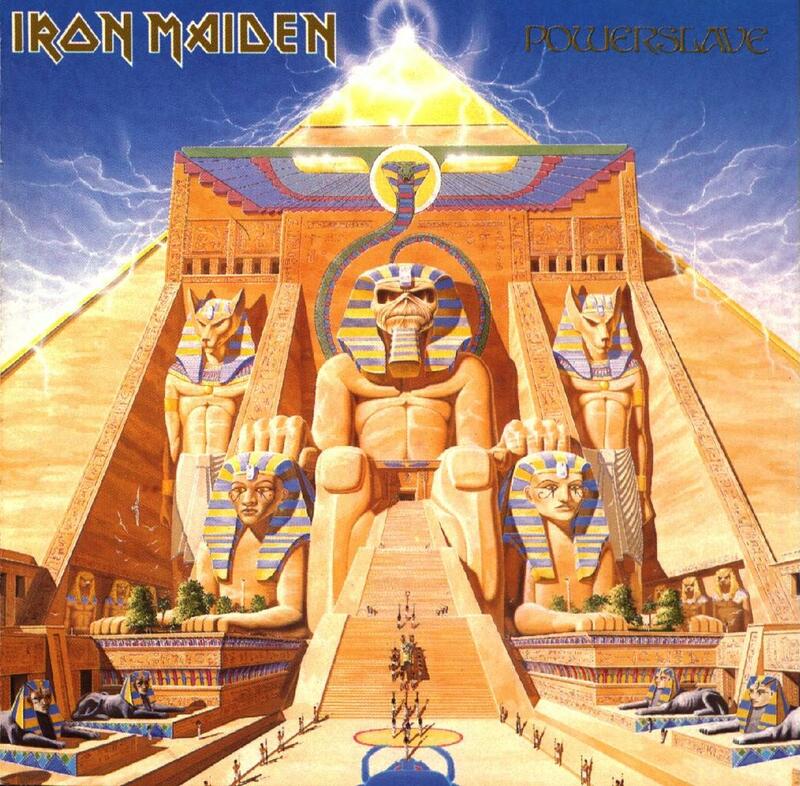 “Powerslave,” (the band’s fifth studio album) depicts ancient Egyptians marching a sarcophagus into a statue of an Egyptian-God Eddie. It was a super-detailed illustration that I was curious to know more about. Powerslave. Album by Iron Maiden, cover art by Riggs. “[They told me] ‘We’ve got this Egyptian thing and we want Eddie as part of a pyramid,’ or something, and Steve Harris had this 18th century engraving of some guy dragging the head of Rameses,” Riggs said. “And he thought he wanted Eddie’s head on there. That was his idea. So copyrights are not even in this [laughs]. So I sort of took the Egyptian idea and I started drawing. I did it on A3 layout paper. A3 is a European paper size. I used a layout pad. It’s like tracing paper, but it’s cheaper and it’s thinner so that you can draw a picture, and then you can drop the next page over the top of it, and trace the good bits and improve it. So I had one of those, and I was sitting there drawing, and I drew the pyramid bit. Then I needed a bit on the sides, so I had to tape the pages together, and then I stuck bits on the top and bottom as well. When I finished it it was about five foot square and it was all taped together. Speaking with Riggs is an experience. At times it can be difficult to keep up with the conversation, with ideas flying so quickly it would be easy to get lost in his imagination. However, after many talks, it became quite evident that – as a creator – he detests predictability and lack of imagination in art. Soon, Riggs said he became dissatisfied with the ideas presented to him by the band, and their lack of vision. It was this disconnect that he said led to his eventual separation from the Iron Maiden organization. “[For the album] “Somewhere In Time”: ‘We want a science fiction city. A bit like Blade Runner.’ Cause they just steal things out of films, that’s all they do,” Riggs said. “I was with them one time and we were walking around a book shop somewhere, and they were looking at the book covers saying ‘Oh, we can have Eddie doing this, and Eddie doing that.’ stealing ideas instead of trying something original. I just had enough of it. They run around making out like ‘they’re all our ideas.’ But no, the ideas that they give me are stolen from other places. But I did the best I could to try to make them original and to inject some life into them. Riggs’ artwork for the album Somewhere In Time, by Iron Maiden. The artwork covered both sides of the LP jacket. Adding to the discord between Riggs and the Maiden camp was the tremendous popularity of Riggs’ art work. 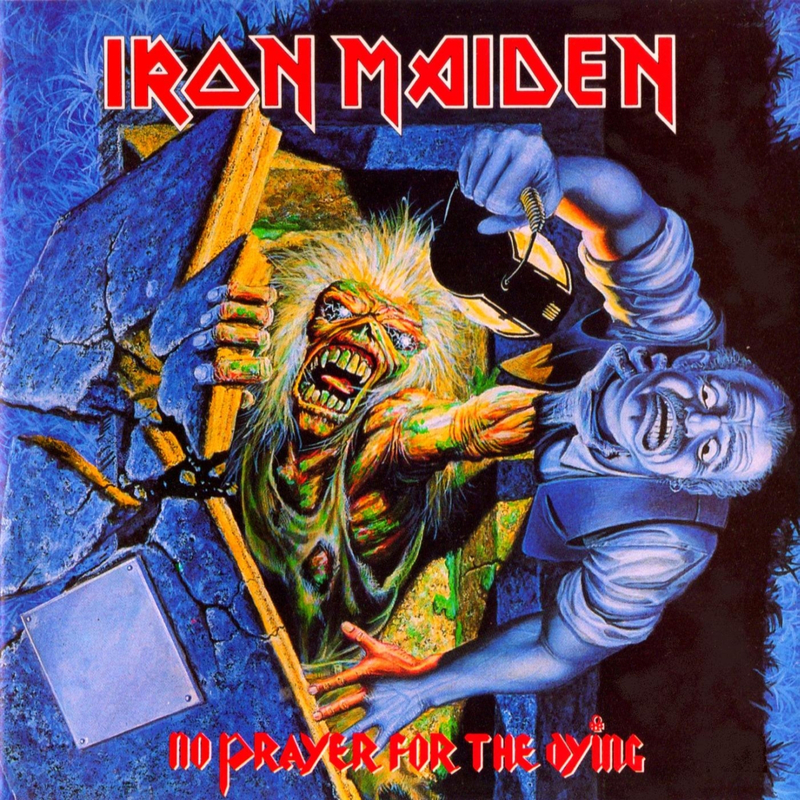 Since Riggs’ last album cover for Iron Maiden – the band’s eighth studio album, “No Prayer for the Dying“, released in 1990 – the artist has been virtually abandoned by the band. No Prayer For The Dying. Album by Iron Maiden, artwork by Riggs. 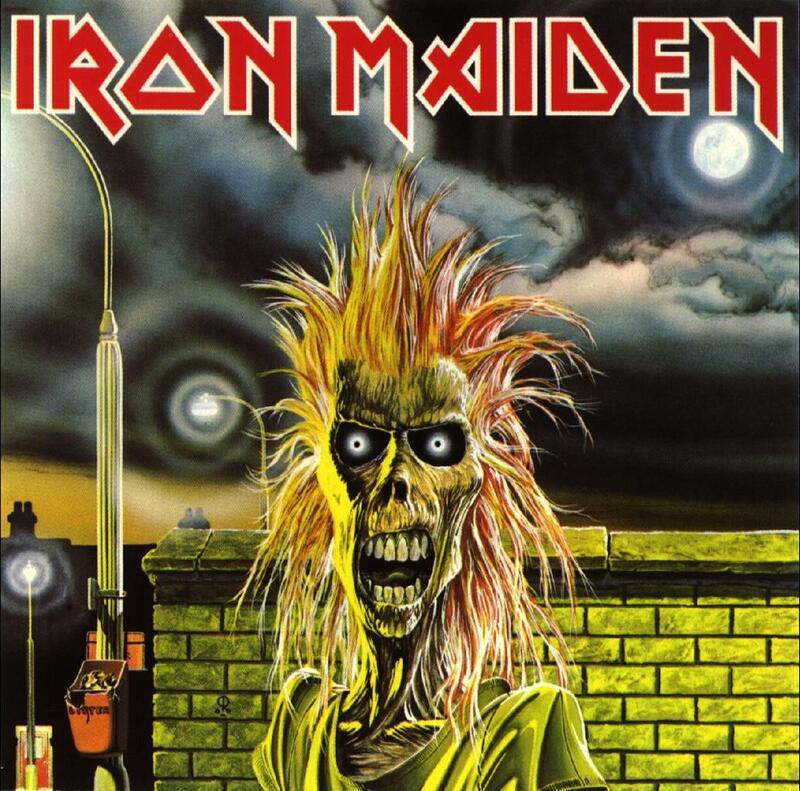 Beginning with 1992’s “Fear of the Dark” Iron Maiden began favoring illustrators that imitated Derek’s style, but failed to achieve the notoriety of his earlier paintings. I expressed how frustrating it was for a fan when he was no longer Iron Maiden’s artist, as there was really no adequate explanation by the band for the change. Although he’s no longer doing album covers for Iron Maiden, Riggs has continued to pursue his vocation as an artist. He experiments with his visual creations, manipulating computer-generated shapes, found media, and blending them with his own rough sketches. He even writes fiction and composes his own music. “Right now I’m trying to write a novel; a horror story . . . My life is a horror story,” Riggs said. I asked him if he had advice for a graphic illustrator starting a new career. I mentioned that I recently spent $40 at an Iron Maiden show for a t-shirt. Riggs said that, although he once favored painting his art, he now works exclusively in digital art. The last traditional oil based painting he did was for the cover of the book Run For Cover: The Art of Derek Riggs. Riggs has recently been drawing some pen and ink pictures of Eddie. Fans can purchase these sets of prints from his Facebook page “Derek Riggs Stuff“. Before we finished, I asked if Riggs would ever consider doing an autobiography of his life. The story is a fascinating one, with plenty of drama and betrayal behind the scenes. Take half an hour’s break to view the Derek Riggs online portfolio at www.derekriggs.com.